Re : Room Renovation Please be informed that City Garden Hotel will proceed room refurbishment for two (2) guest floors (floor 11 and 12) as part of our ongoing commitment to upgrading the hotel. The work will commence from December 21, 2007 to February 6, 2008. Such renovation work only occurs Mondays to Saturdays, from 9 am to 6 pm and Sundays, from 10 am to 3 pm. We will endeavor to keep disruptions to a minimum to your guests and we apologize for any inconvenience might cause to their visit. Your clients, our guests staying with us are of most importance and we welcome any question you may have about this refurbishment and we will make your guests staying with us as comfortable as possible. 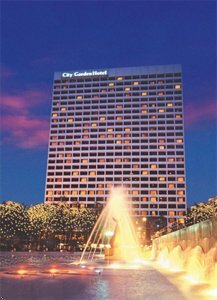 City Garden Hotel dominates the vibrant North Point district at the edge of Causeway Bay. Nearby the head offices of major corporations (Taikoo Place in Quarry Bay) and within walking disctance to the underground Mass Transit Railway. The Hong Kong Convention and Exhibition Centre is a 10 minute tax ride away while the trendy Lan Kwai Fong area is mere 15 minute drive. 613 guest rooms including 15 suites. Spacious guest room with size of 300 sq. ft consist of twin size or queen size beds with attributes designed for well-being and supreme comfort. Brightly furnished with roomy work area features wireless high-speed Internet and phone lines combined with comfortable seating which allows guests to unwind and relax in privacy. Executive Club Floor Rooms and Suites provide the ultimate in personalized service and attention privileged access to the private executive lounge with an array of exclusive amenities including free breakfast. 15 lavish suites and a stately One-bedroom Suite with the size of 600 sq. ft which has a kitchenette with every sensory detail carefully refined to bejust right. Services beyond: Availability of non-smoking, accessible and interconnecting room types. Complimentary access and use of outdoor swimming pool with Jacuzzi and gym with sauna. Provision of extra bed and ultra amenities to meet unexpected needs. Personalized accommodations such as wake-up service, laundry service and room service. Hotel restaurants and bar offer International, South East Asian cuisines and live band entertainment. Contemporary designed Function Rooms suitable for dinner gatherings, cocktail receptions conferences and seminars. Garden Cafe Â In a relaxing surroundings the Garden Cafe serves a wide variety of Asian and Western specialties. An extensive a la carte menu is available along with sumptuous international buffets for breakfast lunch and dinner. Special food promotions are featured from time to time. Satay Inn Â A relaxing greenery with casual laidback atmosphere. Menu features a wide selection of our Singaporean dishes. The Admirals Bar Â an ideal fun live music and cosy atmosphere. Top Summit Seafood Restaurant Â Serves superb Cantonese dishes and a rich selections of dim sum. Banquet and Conferences Â Spacious function rooms with contemporary design and technical support for all types of conference and catering from lavish dinner gatherings to glittering cocktail receptions conferences and seminars. Contemporary designed function room of size 2129 sq. ft cater for max. of 200 persons for variety of conference, seminars, party and events. Standard meeting equipment and PA system to be provided.